9 What If Something Goes Wrong? CASA will also spawn a separate logger window, which logs messages from various tasks. Logger messages are saved in a file 'casapy.log', in your local directory. Whenever you start CASA, the previous log is renamed (based on the date and time), and a new 'casapy.log' is opened. Note that on startup, CASA adopts current settings of environment variables, so set them before starting CASA. For example, PAGER regulates the help display. The cat option works well in both interactive and script mode. In bash, use PAGER=cat. In csh or tcsh, use setenv PAGER cat. Let's get some exhaustive help on the CASA imaging task tclean. There are two basic ways to execute a task in CASA. Note that tget will recall the parameters from the last time you've run importasdm in your current working directory (it reads a file called 'importasdm.last'). If importasdm has not been run before, it will just use the default parameters. You can now set individual parameters from the command line, simply using a Python <parameter>=<value> syntax. and check your logger to make sure things are proceeding smoothly. and then simply press enter. 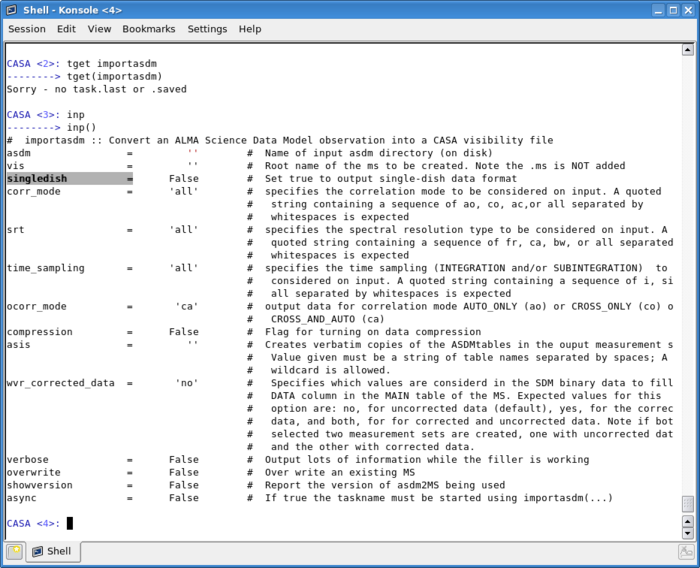 This will both set the parameters for importasdm and run the task, all in one go. Note that any parameters you have not explicitly set in the parentheses will be set to their defaults. If a task is successfully executed, then the successful parameter set is stored in a '.last' file in the working directory. execfile '<filename>': retrieves a set of parameters. Be wary of a parameter's type. Strings will always have quotes around them (although sometimes they can be numbers! e.g., spw = '0'), while floats and integers never will (e.g., diameter=25.0). Boolean variables will be True or False with no quotes around them. One common reason a parameter might turn red under inp is quotation marks which have been mistakenly added or forgotten. You can also use go to invoke a task without changing the current task. For example, you may be setting parameters for plotcal, and wish to verify an antenna name. Typing go listobs will list the observations in the logger, using the parameters that you had set for plotcal (for example, it will use the same measurement set you had set as vis. This is what we mean when we say parameters in the tasking interface of CASA are global. Note that typing go in this case will not change the current task to listobs. Typing inp after this will still give the inputs list for plotcal, since the current task has not been changed. If you want to investigate a measurement set and its sub-tables in more detail, try the browsetable task. This could be done either from within CASA or at the UNIX shell prompt. But be careful; renaming a ms can sometimes break dependencies with other tables, like calibration tables. It's probable that your data won't arrive at your computer in ms format, and you'll have to import it. 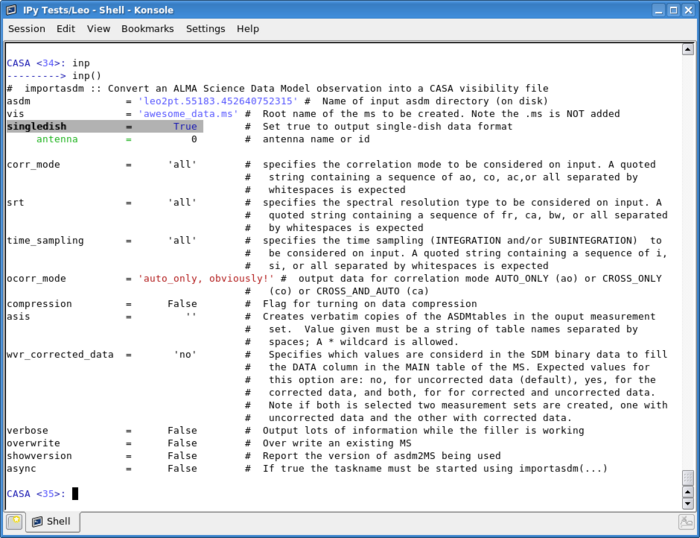 Check out this write-up on Importing Data into CASA. will give guidance on the use of this parameter (and in this case its sub-parameters). If something has gone wrong and you want to stop what is executing, then typing CTRL-C will usually cleanly abort the application. Alert: you may lose contact with the logger GUI if you have one, in which case you will want to restart CASA. will terminate the most common post-crash zombies. Typing help at the CASA prompt with no arguments will bring up the native Python help, which has information about Python commands and keywords. Hitting <RETURN> at the Python help> prompt will return you to CASA. Hitting the <TAB> key completes unambiguous commands or variable names and shows you a list of the possible completions, if there are more than one. It also completes filenames from the working directory if no CASA or Python commands match. Once you have typed enough of a command to make it unique, <TAB> will complete it. This will help you avoid errors due to typos. You can also use up-and-down-arrow command-line recall in the CASA interface. Begin typing a command, and then use the up arrow; you will navigate back and edit commands matching what you typed. Set Python variables using <parameter>=<value> syntax. Python assigns the type dynamically as you set the value, and will allow you to assign an integer value to a string parameter. However, CASA will check types before running a task, and alert you if you have made a mistake. Python variable names are case sensitive. Also note that mis-spelling a variable assignment will not be noticed by the interface. For example, you might wish to set correlation='RR', but instead type corellation='RR'. You will find correlation unset, and a new variable, corellation will exist, with value 'RR'. Using command-line completion and recall helps avoid these errors. Python indices are 0-based. The first element in the list antlist is antlist. CASA also uses 0-based indexing. Field or antenna IDs, for example, start at 0. The first field in a measurement set has FIELD_ID==0. Python uses indentation to determine the level of nesting in loops. Be careful when cutting and pasting, you may get an error (or an erroneous result). The cd command must not use the !. Note: to access a Unix environment variable from CASA, you will need to use $$ instead of $. The step-by-step tutorials on this Wiki will walk you through reducing data. Keep in mind that the official CASA Documentation is provided in CASA Docs. Also check out the CASA Hints, Tips, and Tricks page---it might contain the answer to your question! If you still have questions or think you might have found a bug, feel free to contact us at the NRAO helpdesk. The helpdesk can be accessed through my.nrao.edu (you will need to be registered with an NRAO account first).